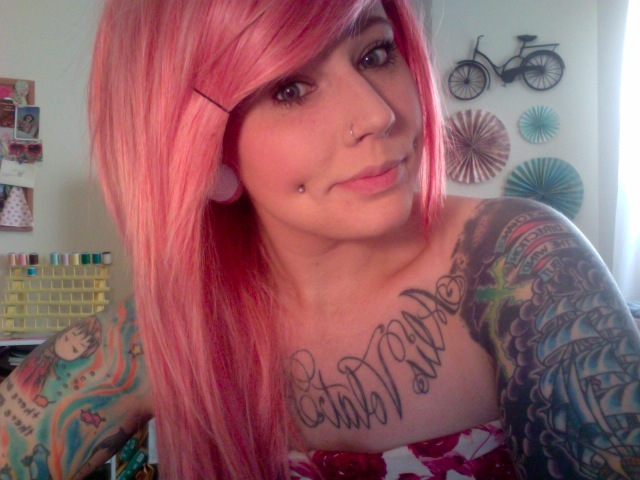 Now when Kaelah sent me her answers and her pictures she had red hair – like gorgeous red hair. Then a few weeks ago she decided enough was enough and went pink – all over (not just the bottom layers like I did a few years ago!) So here I am introducing Kaelah! I started Little Chief Honeybee in May 2009 as a place for my family and friends to keep up with my adventures as I moved to New York City on my own to pursue an art internship at BUST magazine. It has since been a place for me to share my adventures, photos, love, laughter, heartbreak and inspirations with people from around the world. I’ve had an online blog or journal of sorts since 2002! All the way back to LiveJournal/DeadJournal! I still have my LJ but since 2009 I have primarily been at Blogger. I’m currently a full time art student (but only for 3 more weeks!) and I bartend on the weekends to pay the bills. Blogging is definitely fun and I’d love to do it as more of a career, but I’m also pursuing other endeavors such as a dress line, hair accessories and eventually my own boutique/bakery. I really love reading JenLovesKev.com. They just welcomed a little one into their lives and it’s so inspiring to see someone open up their personal life like that and really let you connect. By far my favorite blog at the moment! Jen also has killer style. My mom is a huge one because she taught me everything i know. she’s my biggest fan and i hope to be half the mom she is. also- any and everyone who stands up for what they believe in and refuses to let others make them feel less than amazing. Be genuine and be consistent! Blog for YOU… not for followers or sponsors or anything other than pure enjoyment. If sponsors come, so be it, that’s awesome! But you can’t set out with that as your main goal. There has to be a sense of humanity about you and your blog. People love to be able to relate to you! So in answer to Kaelah’s question…. I’m not sure I have one single one, I guess spending so much time with my family over the holidays is a big deal. We spend so much time charging from one thing to the next that it seems like we don’t always see each other that much. So to catch up with them all at Christmas is really cool. At church each year we have the Nativity or similar performance this year I’ve been involved in writing the script so I’m really chuffed about that. 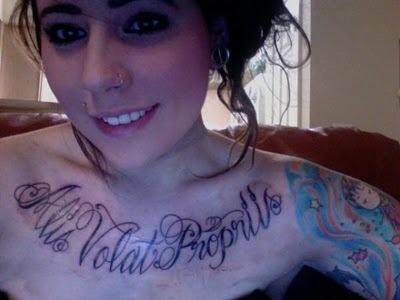 The chest tattoo in the image above reads “Alis Volat Propiis” which is latin for “She flies with her own wings”. 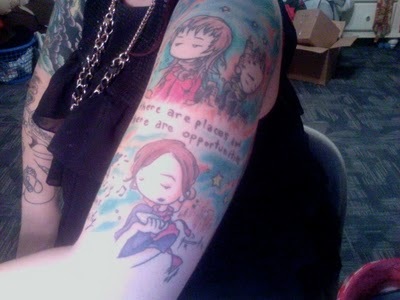 If you want to read more about her tattoos or ask questions you can read a post here all about them. All the images were…sent to me by Kaelah or I have found them on her blog – if you want to use them please let her know (her email address is on her blog) or contact me and I will pass on the email.